It’s Christmas Eve, the wee one is asleep and we’re finishing up the last of the presents. Time for a little midnight snack. 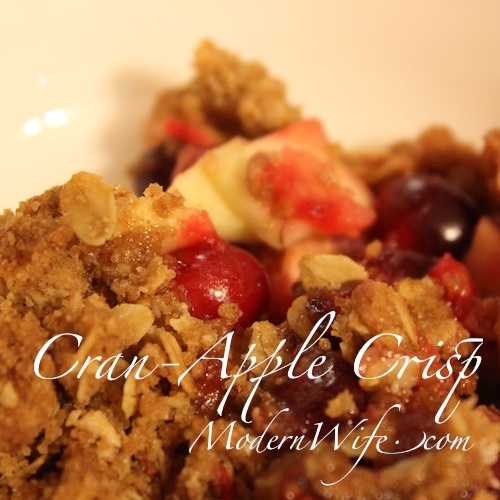 This Cranberry Apple Crisp makes kissing by the Christmas tree taste so good! Rub a pie pan with butter wax paper covers (I save them in the freezer for greasing baking sheets and pie pans and such). Add apples and cranberries to the pie pan. Sprinkle with sugar and toss until coated. Combine brown sugar, flour, rolled oats, nutmeg, cinnamon and butter in a medium bowl until well incorporated. Sprinkle on top of the fruit. You can serve it hot with ice cream. I like it warm by itself on a cold winter night.